With promises to be the year’s, if not the decade’s, scariest film, Hereditary wasn’t the best film for a small cinema in Western Australia to accidentally show a trailer for at a screening of Peter Rabbit. But it happened, and let’s face it: it’s kind of hilarious, childhood nightmares aside. Nevertheless, this film will likely be remembered for much more. And anyone who watches it may remain forever freaked out by the sound of a tongue-click. (Children clip-clopping around pretending to be horses can BACK THE HELL UP). Toni Collette dials up the crazy in her role as family matriarch, Annie, in what many are calling a career-best performance (and they’re probably not wrong). When her family, which includes her husband, Steve (Gabriel Byrne) and children, Peter (Alex Wolff) and Charlie (Milly Shapiro), are plunged into grief, it’s not an event that brings everyone closer together, but rather, closer to hell. Supernatural forces come into play, and the results are truly terrifying. Director and writer Ari Aster has set out to make a convention-defying horror, and while there are still a few familiar tropes, Hereditary takes a different path. Full disclaimer: I’m not exactly a horror aficionado (still slightly scarred from Roald Dahl inspired kids films that are scary enough, thank you very much). With that being said, the genre has sucked me in these past couple of years with some brilliant storytelling (Get Out, A Quiet Place) and repeated promises of “the scariest film you’ll ever see”. However, neither The VVitch or It Follows quite lived up to that hype IMHO, and marketing teams need to STOP with this because it only leads to disappointment. I’m not sure if Hereditary has quite taken that title either (tbh it’s still Angelica Houston in The Witches for me) but it may just haunt this reviewer for a while yet. Aster doesn’t go the route of repeated jump scares or the false bait. Repeatedly we see characters turn slowly around, horrified expressions on their faces at what’s before them, as Colin Stetson’s score builds to a crescendo. We are warned that what we’re about to see is fucked up. And yet. IT’S STILL FUCKED UP. In other instances, horrific images fill the screen in unexpected cutaways – one may never leave me (It’s not mother! level of horrific imagery, but it’s pretty close). There are possibly only two or three gory moments in the film, but that’s enough. Aster carefully crafts other moments in such a way that they unsettle for the sheer fact of what they don’t show. 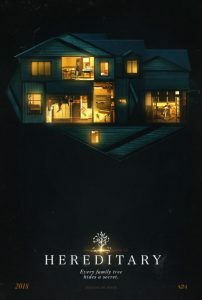 As well as being a horror, Hereditary plays as a family melodrama, and those fascinated by the psychoanalysis involved in the horror genre will eat up the themes about family and the fear of inheriting their worst traits. Further, the reaction of Annie’s husband – the one family member who does not share her DNA – towards her apparent madness is unsettling, but not in the obvious way. Very little about the film is obvious – the narrative does not go where you’d expect which seems a magnificent feat for the genre. The film’s set design links in with Annie’s artistry. She makes minitiare reconstructions of household scenes – not your average household scene, mind you – and the family house doubles as one of her designs. The film begins by focusing on what appears to be an elaborate doll house, slowly zooming in to reveal the first scene. It’s like the characters are pawns in someone’s game, placed into situations that they can’t control. A bit like how we can’t control our genetics. Performances are all terrific. Along with Colette who is an absolute triumph, Milly Shapiro and Alex Wolff give sensational performances as the creepy AF daughter and the downward-spiralling son. The best – arguably most horrifying – scene in the film features just the two of them. But it’s not all them – the scene is written and directed exceptionally well. The fact this is Aster’s feature debut is awe-inspiring. It may not feature any witches who turn children into mice, but I know I sure as hell won’t be approaching any doll houses any time soon. This review was first published on 6th June 2018 at Film Blerg.